Thoughts, Stories, Pictures, Passions, Scripture and Random Ramblings that have to do with my everyday life. "If the Church's worship is faithful, it will eventually be subversive of the culture surrounding it, for God's truth transforms the lives of those nurtured by it"
Tomorrow evening I leave for Holland. While I am there just for a visit. It is kind of like coming home. Four years ago, I was ready to leave Holland, move to Canada and take on this new adventure. This journey is in its concluding stages. This week I finished my last work and I graduate May 23rd, pending the grades of my final weeks of course. In the mean time I am visiting Holland. Spending time with my family, going back to my old home town of Ede, visiting Barcelona, and I get the chance to reflect. It is kind of weird coming back to Holland. The last time I visited was during Christmas of 2006 at that point I was still very much rooted in Holland and getting rooted in Hamilton. Today it feels a bit different, I have started to grow deep roots in Hamilton and my roots in Holland are established, but no longer growing. So, I leave for Holland, my home country, yet it doesn't seem like I am coming home. I will feel that I am coming Home when I fly into Toronto again on May 15. This June I am moving into a house with some dear friends. We have been given the opportunity to live in a beautiful house on the Hamilton Harbour. Six of us will be living in the upstairs house and two will be living in a separate, but connected basement apartment. We will have the opportunity to just live. Be intentional about the simple things in our lives, give thanks for the abundance of blessings, and seek to combine a sense of community and culture in our home. (Once we get closer to that day, I will post pictures and be sharing more about this. I am coming home. Perhaps surprisingly Hamilton has become that home to me. Initially due to my four years at Redeemer, now it continues to be home as I will start the next part of my journey here. There is so much to be thankful for. The lack of public places in Suburbia. There are often two responses to my strong opinions against suburban development within cities. There are those who have not really considered it, and also don't think it is really important, they remind me of the apparent positives of suburban development - privacy, comfort, and ease. Then there are those who have thought about urban development a bit, or perhaps even a lot they almost always respond by agreeing. 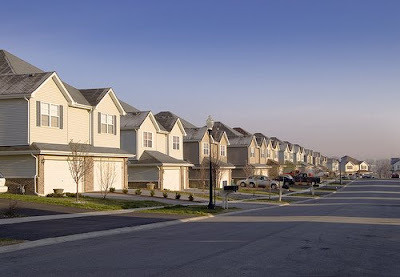 The book Suburban Naiton by Andres Duany, Elizabeth Plater-Zyberk, and Jeff Speck have offered me some more insights on some of the underlying stories of suburban development. The (North) American private realm is a superior product... I have to agree with this statement. We have created more private space that seeks to serve our comforts than one could possibly imagine. What is considered a tiny home today, was a normal to large sized home just 20 years ago. While a private realm which exceeds our needs is problematic enough, I think more worrysome is the fast decline of our public realm. The public realm is degraded to a mere emptiness. The public square, the public street, and the sidewalk have been reduced to a roads 40 feet wide, lined with sidewalks leading to nowhere, and a landscape where the variety of garage door sizes are the high point of aesthetic playfulness. The people I have resided with for the past two years. I just finished up my first course in my last semester. At times frustrating, at times very rewarding, I think I can leave this course being able to put into words a bit better, why an aesthetically obedient life is of value. I am not an artist, dare I say, much of my creative juices can be traced back quite easily to a few influences in my life. And I am quite content with that. Yet, I realize that even though I don't produce works of art or create groundbreaking ideas regarding aesthetics, I do feel that part of my life is closely tied to enjoying the richness of goods creation, and accordingly cultivating that richness where possible. There are two themes that have really stuck with me from this course. First - take time. Take time to enjoy a cup of tea, take time to become aware of the places you reside daily, take time to recognize the abundance of goodness in God's creation and act accordingly. Two - surround yourself with those willing to learn. While there are aesthetic and artistic leaders present around me, most of the people any of us know, are not that different from us. Which makes it even more crucial that we surround ourselves by those who are willing to learn, experiment, challenge, and engage some of the peculiar things that a playful aesthetic life opens up. Surround yourself by friends, family, somewhat familiar "experts" on culture and listen. To finish this post... Here are some links to some artistic leaders or worksAn close to me or in the broader community which are worth following. It is remarkable how God can prepare you for months to hear a message and it can still hit you very hard. Furthermore it is remarkable in a negative way how badly the season of Lent ties in with papers and exams. This morning a long time friend of mine walked into the library - it is remarkable how the presence of a friend can encourage someone. Sometimes it is hard not to feel grim about this world, and how badly we take care of it. Wikipedia has an In the News section on their front page. This is what it read this very morning..
American businessman Bernard Madoff pleads guilty to the largest investment fraud in U.S. history. Cougar Helicopters Flight 91 ditches in the Atlantic Ocean near Newfoundland, Canada, killing 17 people. An oil spill in Australia's Coral Sea is reported as Queensland's worst environmental disaster (affected Sunshine Coast pictured). A school shooting kills at least 15 people in Winnenden, Germany, and another shooting spree kills at least 10 people in the U.S. state of Alabama. A suicide attack kills at least 28 people and injures 57 others in Baghdad, Iraq. Two British soldiers from the 38 Engineer Regiment are fatally shot in County Antrim, Northern Ireland. NASA launches the Kepler spacecraft, a mission to search for Earth-like planets. Unless there is some sort of awareness that we are perhaps not doing a very good job at being stewards to this earth at being Ambassadors of Christ's reconciliation why would we look for other Earth-like plants. It is not the case that I am currently in some kind of state of disillusion and unbelief at our failures. Reading these few news items serves more as a reminder of the enormous task, and our call or renewing - one step at a time. those who hear not the music, think the dancers mad. I Can See a Lot of Life in You.